This vintage style double heart design gift set carries an intertwined romantic heart design and offers 2 fabulous gifts in one set. 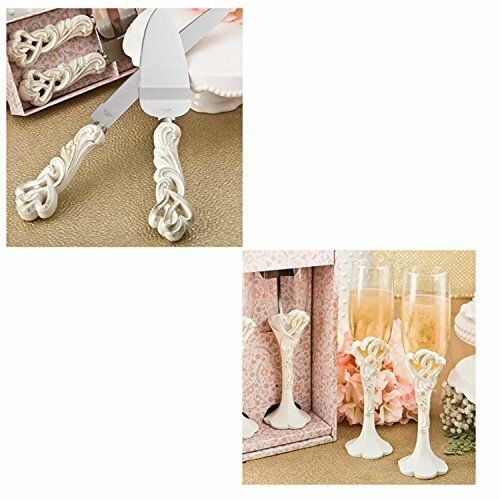 The set includes two glass flutes, and a cake server and knife set. Each item features a double heart design crafted from poly resin and hand painted in an antique vintage ivory color, finished with rubbed-in gold leaf accents. The flutes are made of glass and hold 8oz. The cake set features stainless steel serrated blades for easy cutting. This premium gift will add a classy touch to your event tables and make a lasting impression on your guests. Flutes are 9 1/4" x 2 3/8" each. Server size is 10 1/4" x 2". Knife size is 12 5/8" x 1". A magnificent and meaningful favor with a romantic heart theme! Each item features a double heart design crafted from poly resin and hand painted in an antique vintage ivory color, finished with rubbed-in gold leaf accents. If you have any questions about this product by Combined Brands, contact us by completing and submitting the form below. If you are looking for a specif part number, please include it with your message.